This post was created in partnership with Dannon® Oikos Triple Zero™ Yogurt. All opinions are of course my own! You can look here for more recipes using Oikos, and I really hope you enjoy this recipe as much as I do! Oh, and, I have a special coupon for you below! 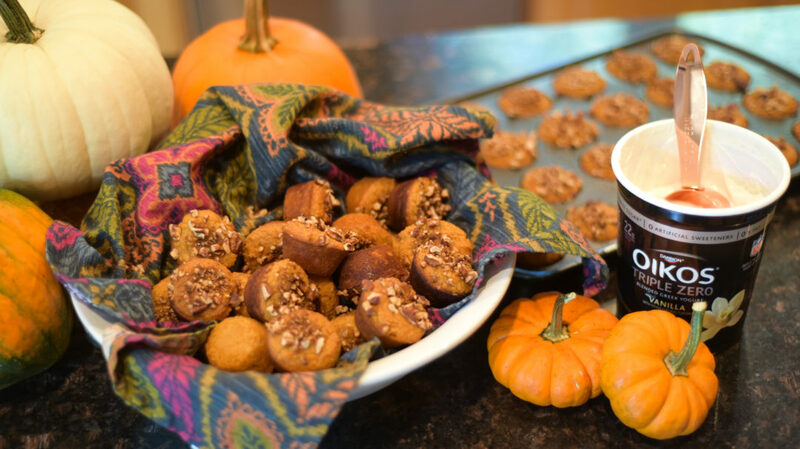 Hot muffins in on a crisp fall morning (with a giant cup of coffee). There’s nothing like them. 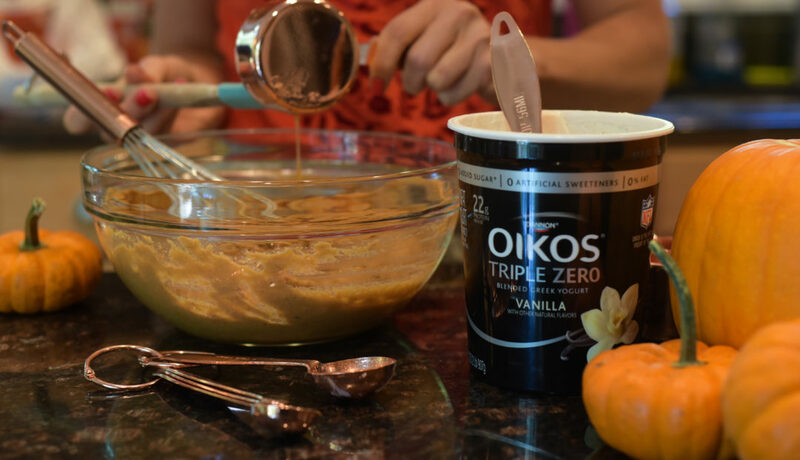 You may have noticed I create many of my muffin recipes using Oikos® Triple Zero™ Vanilla Greek Yogurt. There’s several reasons for that. It’s rich, creamy, and adds a delicious texture to the muffin itself. Also, Triple Zero™ Vanilla is 22 grams of protein for 1 cup! …and it’s sweetened with stevia. So it’s my go-to yogurt, whether it’s for eating on the run, or creating recipes with…you’ve got to try it! An important note is to make sure that your muffin tin is either well-sprayed with nonstick cooking spray, or well-coated with coconut oil. This will encourage the muffins not to stick one bit. 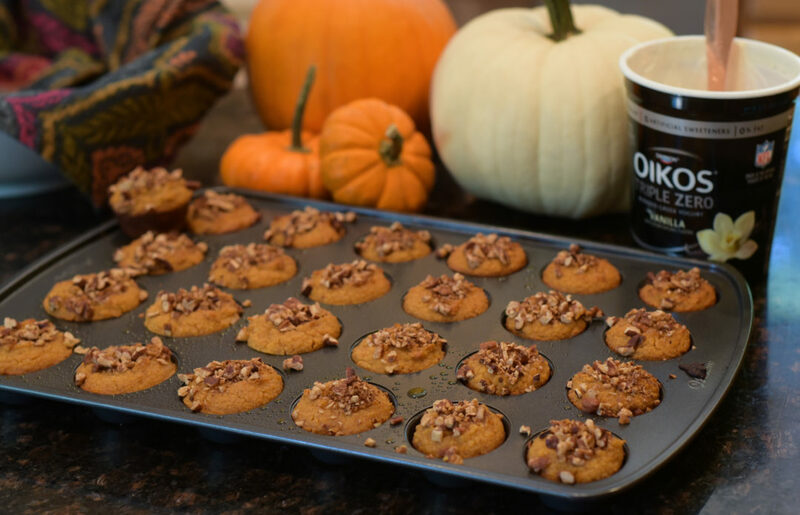 Also, resist the urge to overfill those muffin cups! I use to love to pile them high, but almond flour, though it rises, tends to grab on for dear life to whatever surface is nearby. So, just know, if you overfill them, you’ll end up with a “cookie” on top, instead of a muffin top. Leave them small and cute! Find me on Facebook, Pinterest, and Instagram to get more deliciously healthy recipes! 1. 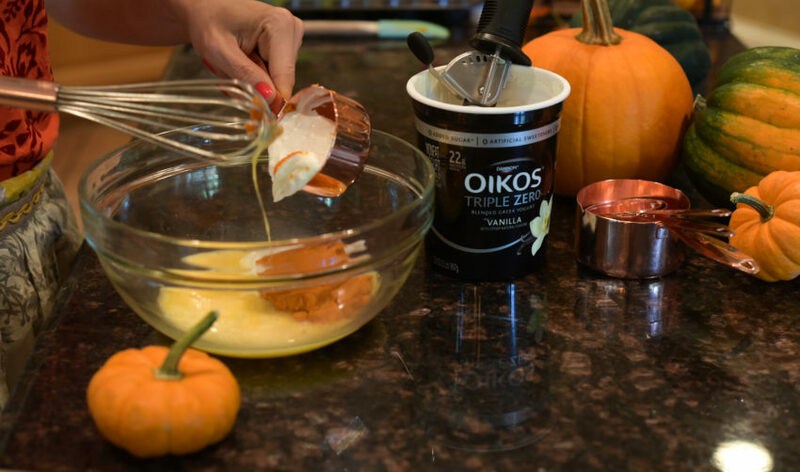 Preheat oven to 350 degrees F. In a medium bowl, beat eggs with a whisk or fork for 1 minute. 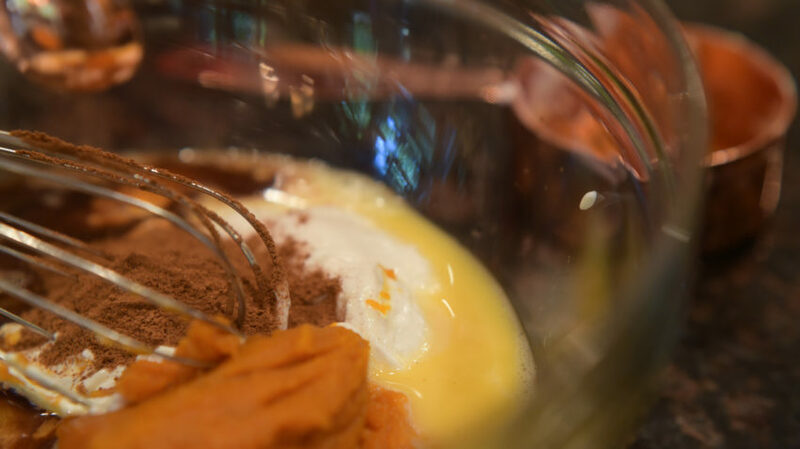 Add yogurt, pumpkin, and honey, and whisk again until smooth. 2. Spinkle almond flour (1 1/2 cups, plus an additional 2 tablespoons), pumpkin pie spice, baking powder, and salt on top. Stir together until evenly incorporated. Pour in coconut oil, and stir. Batter is ready to go! 3. In a mini-muffin tin that’s been well sprayed with nonstick cooking spray (or coated with coconut oil), scoop batter so that each muffin cup is 2/3 of the way full (don’t overfill them!) You should be able to get 30 mini-muffins from this batter. 4. 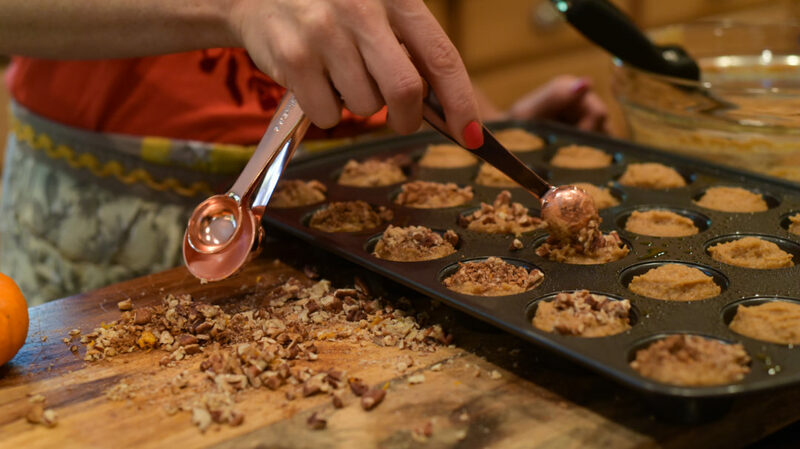 Mix together pecans and ground cinnamon in a small bowl, and sprinkle a little on top of each unbaked muffin. 5. Put in the oven and bake for 14 – 16 minutes, until done. Remove and let muffins cool. They should easily pop out of the pan by tilting it a little bit and giving them encouragement! Enjoy! Hi Donna, the stevia is what they yogurt itself is sweetened with. Have you ever tried it? The taste is amazing. Hope that helps! Thank you for this comment Jenny! I’m so glad you all loved them! The changes are SUPER helpful too. Try these! They are so good and more satisfying than regular muffins made with wheat flour. I will be making them again soon. Thank you Ginger!!!! So glad you liked them. I made them for Thanksgiving dinner. So easy to make and turned out amazing and this is from me, who doesn’t bake! They were a hit!!! I did half with the nuts and half without for my brother in law who doesn’t like any type of nut PLUS he usually doesn’t go for anything that’s remotely healthy. It was great seeing him enjoy it!! I will definitely make these again.